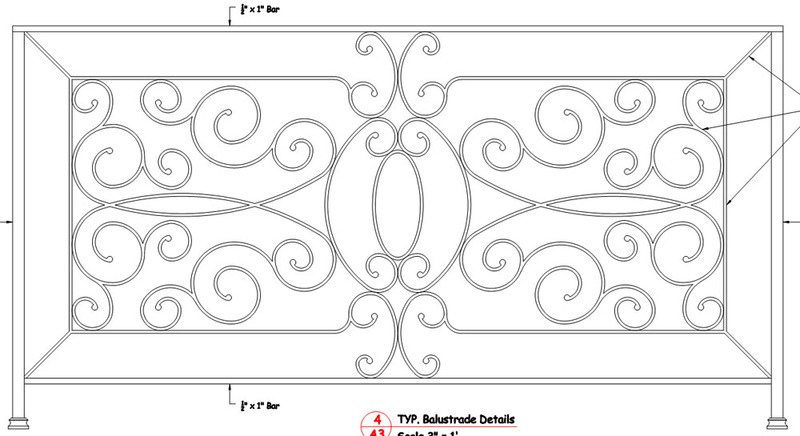 We were given this Wrought Iron Railing design that a builder wanted for his client. We were appalled. 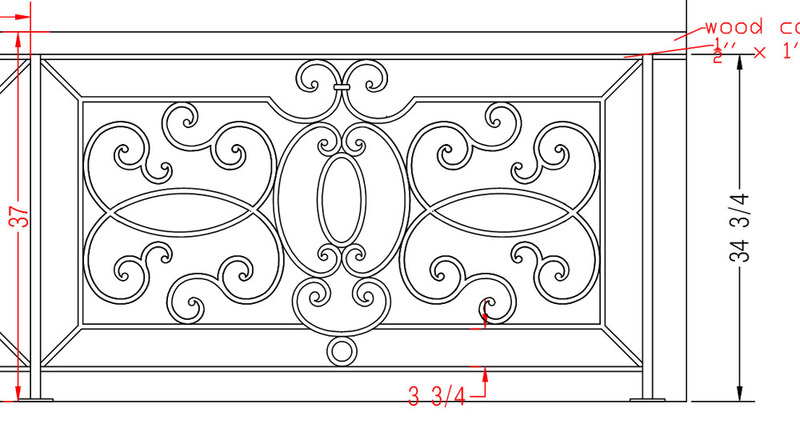 The Iron railing design was horrible…. The railing scroll design violates Archimedes, where the negative space of a forged scroll starts small and continuously gets larger. The scroll ends were awful, simply a piece welded to the end, no craftsmanship whatsoever. The radii did not flow together, it had kinks and flat spots, it was not visually pleasing whatsoever. The material specified was too thin, which made it look puny and chintzy. We looked at it and totally redid the entire balcony railing design. We created everything Archimedes throughout to remove that pain in the eye. We made all scroll ends in hand-forged roll-ups, which provided excellent individuality and authenticity. We evaluated the starting point of every scroll, the space it needed to fill for Iron stair railing code to meet the 4” rule, and had the arc be as harmonious as possible. We more than doubled the material thickness to have it portray elegance and character for years, decades and generations of use enjoyment for those that are following in our footsteps. 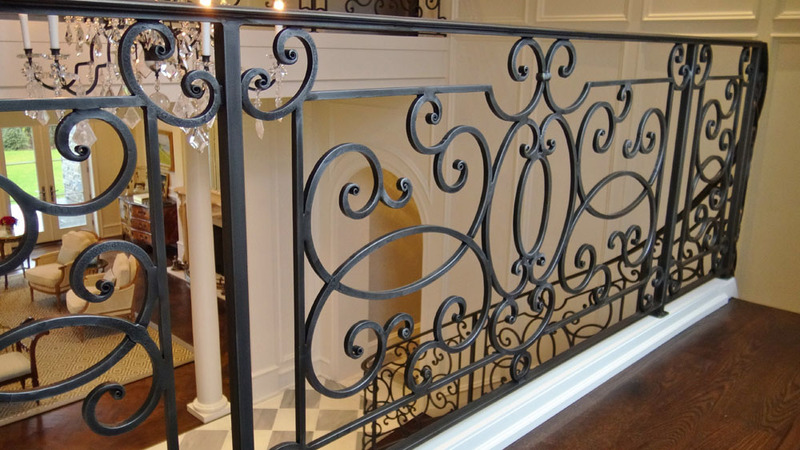 And for the final wow factor, the stair railing finish was done in a traditional blackened wrought iron railing finish. First the entire thing was blasted to achieve a texture on virgin material. Then the entire thing was treated with a special blackening chemical which turned it black instantly! Then for a lot of scotch briting the old-fashioned way, by hand, to remove all the chemical evaporation residue and to have the underlying gray/silver of the metal railing enhance the inherent texture. Then the entire thing was wiped down and cleaned off. Heated to 110°F. Then the entire project was hand-rubbed with beeswax, just like they did 100 years ago with Samuel Yellin Wrought Iron. 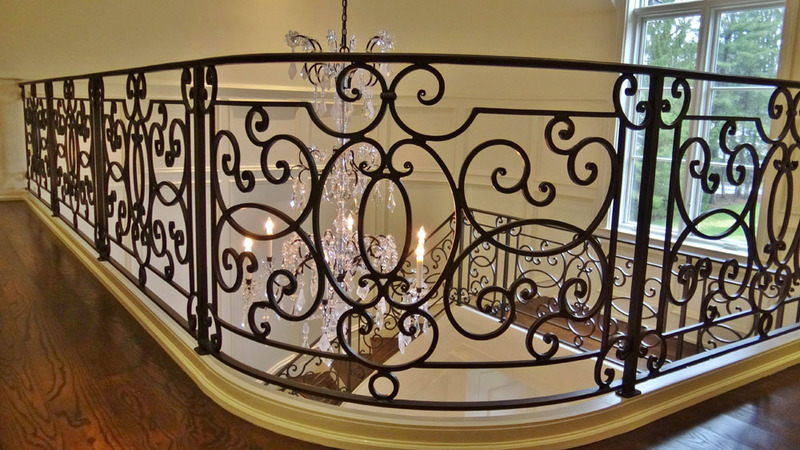 The client, architect and builder were thrilled with the final result of this beautiful Iron Stair and balcony railing, it was a perfect fit for their architecturally correct Mainline Philadelphia Home.